SSM announce their participation to the forthcoming Techtextil in Frankfurt, Germany, from May 14th to 17th 2019. Techtextil is Europe’s leading fair for technical textiles and nonwoven products. The show is covering twelve application areas, which comprehensively span the full range of modern textile technologies. SSM presents their winding solutions for technical yarns; with the SSM DURO-TW precision winder for all technical yarns up to 50’000 dtex , SSM offers a new level of flexibility and winding quality in one machine; thereby ensuring the fulfilment of all customer requirements. For the assembly process the SSM DURO-TD allows the plying of multiple ends/yarns. Optional intermingling guarantees loop-free twists as well as optimal unwinding during twisting. The ability to run closed precision winding enables higher package densities, thereby increasing the knot-free length. 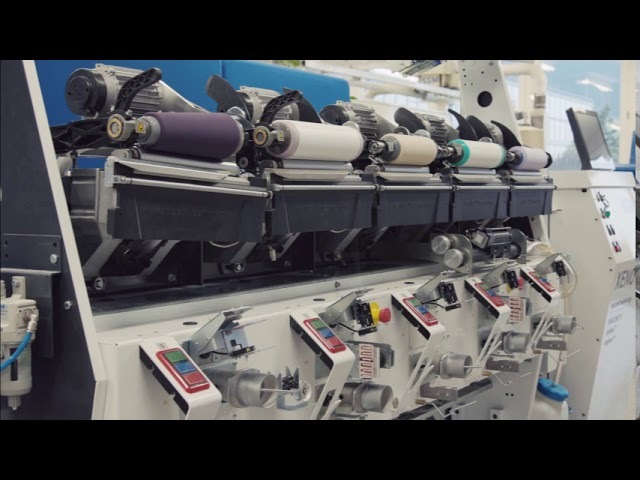 With an excellent reputation for high quality textile machines and maintaining a worldwide service network, SSM is providing the maximum return on customer’s investments. Please be informed that our office in Horgen, Switzerland will be closed from Friday 19th of April until Monday 22nd of April 2019 for Easter holidays. SSM attended two exhibitions in the first quarter: DTG in Dhaka, Bangladesh and IGATEX in Karachi, Pakistan – great number of visitors have been welcomed. The exhibitions took place on joint booths of the SSM representatives. During the shows, SSM met many existing, and also potential new customers that showed interest in their products. Thanks to the great effort and support of the SSM agents the exhibitions have been a great success. Increasing customer demands require increasing sales service responsibilities. To strengthen the worldwide team and to achieve complete customer satisfaction, SSM Schärer Schweiter Mettler AG is pleased to announce the appointment of Roman Haefeli as Head of Sales. As of January 1st 2019 Roman Haefeli has started as Head of Sales and member of the management board of SSM Horgen. Mr. Haefeli holds a degree in mechanical engineering from the Swiss Federal Institute of Technology (ETH) and many years of experience in research, development, operations and sales. SSM welcomes Roman Haefeli and wishes him a good start and a lot of success and fulfillment in his new function. SSM Schärer Schweiter Mettler AG has appointed Marco Mori as Chief Financial Officer. He has started as of February 1st 2019 as CFO and member of the management team of the SSM Group. Mr. Mori holds a Bachelor of Science in Business Administration from the University of Applied Sciences in Southern Switzerland (SUSPI) and has many years of experience in finance and controlling. SSM welcomes Mr. Mori and wishes him a good start and a lot of success and fulfillment in his new function. SSM showed several new product launches for the first time in Asia at the ITMA Asia in Shanghai, China from 15th – 19th October 2018. Large interest was generated by the SSM air texturing machine as well as for the new drum winder which had their world premiere. SSM was very pleased by the high response. This year’s show attracted a large number of visitors. SSM as one of around 1&apos;700 exhibitors from 28 countries and economies could impress the visitors by showing a wide range of applications and latest technology solutions to help textile producers to become more competitive. For the first time ever, SSM presented their brand new drum winder with lowest power consumption per spindle. The small pitch and integrated control cabinet maximize the space utilization. Thanks to the new developed and single controlled motor, it is the ideal machine for an energy efficient rewinding of cones used in the weaving, warp knitting and circular knitting process. Undoubtedly the air texturing machine from SSM attracted the largest attention. Benefitting a wider range of applications, such as fancyflex™ options for the production of slubs and thick & thin effects. Besides of this, several new product launches had been introduced to the public as well. SSM would like to take this opportunity to thank everybody who visited the booth and is looking forward to future partnerships and collaborations. We congratulate the agency Altex Machinery International Ltd, Taiwan, on winning the “Rieter Components Agent Award" for Asia. Altex Machinery International Ltd achieved this appreciation for the professional representation of our products and corporate values, the executed promotional activities and the achievement of the sales targets set for the year 2017. The precious award was handed over by the SSM CEO Dr. Davide Maccabruni to Albert Lai during the agent meeting prior to the exhibition ITMA Asia in Shanghai. We congratulate the agency TEXTIMA Export Import Gmbh, Uzbekistan, on winning the “Rieter Components Agent Award". TEXTIMA Export Import Gmbh achieved this appreciation for the professional representation of our products and corporate values, the executed promotional activities and the achievement of the sales targets set for the year 2017. The precious award was handed over by the SSM Sales Manager Önder Günes to Sascha Händler, Nargisa Machkamova, Sajora Khasankhanova, Djakhangir Djabbarkhodjaev and Khanifa Bastamkulova, during the exhibition Caitme (5-7 Sept. 2018) in Tashkent. In the first four month SSM Schärer Schweiter Mettler AG attended eight exhibitions around the world. In Colombia, Bangladesh, Japan, Russia, Indonesia, Vietnam, Turkey and Pakistan SSM could convince the interested visitors about their solutions for yarn processing and winding. The exhibitions in Colombia, Bangladesh, Russia, Indonesia and Pakistan took place on joint booths of the SSM representatives. During the shows, SSM met many existing, and also potential new customers that showed interest in their products. Thanks to the great effort and support of the SSM agents the exhibitions have been a great success. For Japan Yarn Fair and Saigontex, SSM had their own booth with the kind support of their local representatives. There, the main focus was given to the high range of possibilities SSM customers could profit. With final packages, wound on SSM machines, as well as knitted textile samples the visitors could feel the difference. The biggest appearance of SSM was at the ITM in Istanbul, where they combined the sample bobbins & textile (made on the TG30-ETC) with the winding and yarn process machines, such as DP5-T for creating slubs and neps, the XENO-AC for air covered yarns or the XENO winding and doubling machines including DIGICONE® 2 for higher dyeable package densities. Last but not least the PWX-MTC, SSM’s latest machine for rewinding of highly elastic yarns on muffs or hanks, had been showed. Over all SSM had a successful appearance on the shows around the globe in the first four month and they are looking forward to the exhibitions to come, in order to serve the market with their latest and best solutions for the textile industry. Until then, detailed information about their textile machines with leading technology is available on SSMs webpage. Just like all modern textile machines SSM machines rely on a stable electricity supply to function correctly. A stable supply also extends the lifetime of the electronic boards and makes the machine more efficiently. What’s a stable electricity supply? An exact definition of a stable supply is given in the European Norm (ex. EN50160). SSM assures its machine function correctly if the norm is fulfilled. To test if a supply is inside the norm you have to analyse your net over a long time. Variations over the seasons have to be taken into consideration (summer/winter influences etc.). Often a weekly analyse will give you sufficient information about your net. SSM can offer a short analyse of your net. Very often though consumers know their supply. Important are the amount of main power shortages and voltage variations. • Is the grounding system of the machine correct? • Sufficient cross section of the supply pipe? • Avoid connecting machines of different power classes to the same main distributor. There are a number of devices that can help to protect a machine, e.g. UPS (unbreakable power interrupt), power stabiliser, flash protector, or net filter. It is important to choose the best and most economical solution. The beside checklist will help you to choose appropriate equipment. Indus Group started its business in 1955 with one cotton ginning factory and now they are one of the best established textile groups in ginning, yarn spinning and towel businesses with over US$70 million annual turnover. What made you believe that SSM AG was the best for achieving your desired result? In 2005 we bought the first machine CW1-D assembly winder from SSM AG. Since it is a drum winder we didn’t get many extra benefits comparing to other options available in the market, however we found the best after sales service and support from SSM. Later on we bought some Japanese and Indian assembly winders which were not as good as the SSM drum winder machines. In 2014 MAKVIZ came up with the new idea of knot-free packages on same size TFO pot. We bought the first TW2-D precision assembly winder from SSM and surprisingly with the help of the precision winder we got knot free package which helped us to improve the efficiency of our TFO machines and eliminated our major complaint of twist variation due to knots/splices. Having this experience we bought seven SSM precision assembly winders (TW2-D / TWX-D) within our group up till now. How did you find the machine/service of SSM and are you happy with the completed job? With no second thought, SSM manufactures the most eligible machine to perform the desired job and we enjoy the best after sales services from SSM compared to any other supplier in the world. Would you extend your production with SSM machines and recommend them to a friend? We are in process to replace our old winders and SSM’ precision winders are our first and only choice, since we are proud to have the SSM brand in our production facility. We are already recommending SSM precision winders to other textile companies. What are the two most significant improvements that have resulted from work with SSM AG? We are able to achieve approximately 25-30% more weight on the same package dimensions, with the help of SSM precision winders, compared to random wound package. We are running SSM’s new model TWX-D at highest speed without any yarn breaks, due to proper tension control on all spindles, which helps to gain higher efficiency on the TFO process. We aim to provide superior products, financial security, high performance and quality services that fully meet the needs of our customers and maintain the financial strength of our company. We invite our valued Clients to come and see us how beautifully we are doing all this. DIGICONE® step precision winding – developed by Schweiter in the 1970s – combines the advantages of random winding and precision winding. The ratio between double strokes and number of revolutions is kept constant for a certain diameter range. The crossing angle varies only slightly within a range of ±1°. This results in an enhanced package density that does not change with increasing package diameter. So the building of pattern zones is avoided and the package maintains a stable structure without any ribbons. Due to this stable structure, the risk of complete layers “slipping off” during the unwinding process of dyed packages, as known with random winding, is completely eliminated. The introduction of the XENO platform opened new possibilities for optimizing the winding algorithm. Thanks to this new machine platform, SSM could release DIGICONE® 2, enabling an increase of dye package density by another 10–24% with unchanged dyeing recipes. Density analysis method x-view™ by SSM Schärer Schweiter Mettler AG influences the textile market. At the ShanghaiTex 2013 SSM has introduced the x-view™ density analysis. Since then the state of the art method was used for further improvements of SSM’s winding technology for the benefit of their customers. The first part of the density analysis is performed on an industrial x-ray CT (XRCT) scanner. Here the yarn package is digitally x-rayed from several directions. These recordings are then calculated for a three dimensional computer model of the yarn package. The computer model serves as raw-data source for the final analysis. Several cross sections are measured to form the mean density profile of the examined package. The density analysis with an XRCT scanner allows finding fine-tuned winding recipes for specific requirements. Furthermore it enables SSM to steadily improve their winding technology or to create customized yarn packages. With its customers in mind, SSM is in contact with material testing labs to make the x-view™ analysis better available. Thanks to the commitment to technological innovation, focused on cooperation with best partners in the field and with industry leaders, nowadays SSM is recognized as innovative leader in Yarn Processing and Winding – Swiss developer, leader and inventor of the electronic yarn traverse system. Discover the free SSM app: daily support to get the latest SSM product information, yarn calculators and live production overview for your smart phone. Thanks to the SSM App, helpful information is available all the time. With the SSM Mobile Tools you got a quick access to SSM's product range and news, as well as to useful tools to enhance your productivity and to plan your production. Being smart with SSM and join it now! Click on the below icons and download the app from the store. SSM Mobile in the App Store of Apple Inc.